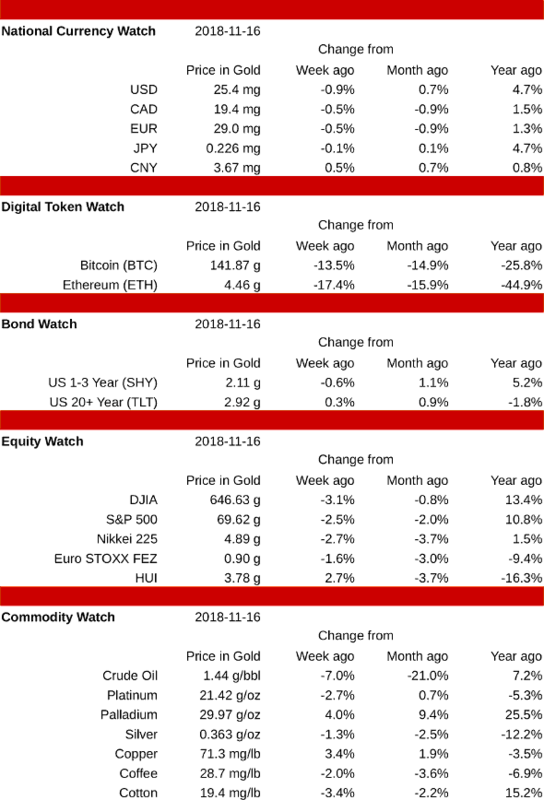 Cryptocurrency markets were hit hard this week, as Ethereum (down 17.4%) and Bitcoin (off 13.5%) closed at new lows for the year (More on this below.) Crude oil was also hit hard, falling 7.0%. Most other asset classes were also lower, but there were exceptions, including palladium, which rose 4.0%, and copper, which gained 3.4%. The Chinese Yuan was the only rising national currency, adding 0.5% this week. The US Dollar dropped the most, giving up 0.9%. US bonds did better than cash, as the 1-3 year treasuries fell 0.6%, and the 20+ year treasuries gained 0.3%. Bitcoin and Ethereum followed similar trajectories, holding up well until Wednesday, then falling hard Thursday and finishing the week down 17.4% and 13.5% respectively. Several factors have been called out for this drop, including the hard fork of BCH that occurred on Thursday which may indirectly affect Bitcoin mining difficulty, and the SEC action to reclassify two utility tokens (Paragon and Airfox, both based on Ethereum) as securities – which will require refunding millions of dollars raised in their ICOs as well as payment of large fines. The SEC action has put much of the crypto space into a scramble to raise cash, as further enforcement actions are expected. Bitcoin and Ethereum are not directly affected by the SEC action, but it has caused selling of BTC, and ETH in particular, as they are the main liquid assets held by many blockchain startups – especially those whose tokens are built on the Ethereum blockchain. Gold stocks were higher by 2.7%, but all the major stock indexes were lower, led by the Dow Jones Industrials, which fell 3.1%. The Euro STOXX 50 dropped the least, closing down 1.6%. Commodities were mixed, with crude oil plunging 7.0% and cotton falling 3.4%, while palladium surged 4.0% and copper gained 3.4%. Silver and platinum were lower, down 1.3% and 2.7% respectively. Palladium is now at its highest level in 15 years, approaching parity with gold.